He was the first premier and defense minister of the State of Israel. He was born in Plonsk (Płońsk), Płock region, Poland, the son of Avidor Grün. He attended a “cheder metukan” (improved religious elementary school) and had a private tutor. At age sixteen, he co-founded the Poale-Tsiyon organization in Warsaw. In1906 he made aliya to Israel. As a pioneer in the second aliya, he devoted himself to working the land in Petach Tikva, worked in the wine cellars in Rishon Lezion, and in the mornings occupied himself with organizing Jewish labor. He contributed to the founding of an agricultural cooperative in the Galilee—the first kernel of a subsequent kibbutz. In the Galilee, he was also a co-founder of Hashomer—the first Jewish self-defense organization in Palestine. During Sukkoth in 1906, he chaired the foundational meeting of the Poale-Tsiyon organization in Palestine and served as the subsequent leader of the Poale-Tsiyon Party. Over the years 1912-1914, he studied law in Istanbul. From 1914 he was back in Palestine. Disregarding the fact that he was a Turkish citizen, he was arrested at the beginning of WWI and deported from the country (together with Yitzḥak Ben-Zvi). From 1915, he was in the United States where he married, and he wrote for the Jewish press, occupied a number of managing positions in the American Poale-Tsiyon, founded (together with Y. Ben-Zvi) the Heḥalutz (Youth Zionists) in America, and was active with Yidisher kongres (Jewish congress). In 1918 he helped establish the Jewish Legion, and he returned to Palestine via Canada and England. Back in Palestine he co-founded the United Jewish Socialist Workers Party in 1919, became its representative, and in its name he traveled to London to establish ties to organized labor in Great Britain. In 1927, following the unification of the United Jewish Socialist Workers Party and Hapoel Hatsair (The Young Worker [a Zionist labor group]), he became chairman of the unified party and a member of Vaad Haleumi (Zionist National Council). He was also the general-secretary of the Histadrut (Zionist Labor Federation), and as its agent he traveled to Moscow in 1924 and many times to the United States. He was a member of the Jewish Agency in Jerusalem and later its chairman, as well as a participant and spokesman for the Jewish side at all British-Palestinian exploratory commissions. During WWII, he co-founded the Jewish Brigade in the British army and served as leader of the underground Haganah. In 1946 he visited the camps of the Holocaust survivors in Germany and Austria. In 1951 [and again in 1971] he received the Bialik Prize. From 1953 when he held no official positions of state, he became a member of Kibbutz Sde Boker in the Negev. In 1955 he again became prime minister and defense minister of the State of Israel. Ben-Gurion began writing in 1915. He published articles mainly on topics concerned with the land of Israel. He published in Idisher kemfer (Jewish fighter), Yidisher kongres, Varheyt (Truth), Amerikaner (American), and in Borokhov’s anthology In kamf far yidishe rekht (The struggle for Jewish rights), among others. From 1954 he was a regular contributor to Tog-morgn-frayhayt (Daily morning journal). Among his books and pamphlets: a second, enlarged edition (in Yiddish) of the Hebrew-language collection (together with Y. Ben-Zvi) Yizker, tsum ondenk fun di gefalene vekhter un arbeter in erets yisroel (Remembrance, to the memory of the fallen guards and workers in the land of Israel) (New York, 1916/1917); Erets yisroel in fargangenheyt un gegenvart: geografye, geshikhte, rekhtlekhe ferheltnise, bafelkerung, landvirtshaft, handl un industri (The land of Israel past and present: geography, history, legal circumstances, population, agriculture, business, and industry), with three maps of the country and eighty pictures of Israel (with Y. Ben-Zvi) (New York, 1918), 477 pp. ; Di erets yisroel politik funm yidishn folk (yidishe oysern politik) (The Israel policy of the Jewish people, Jewish foreign policy) (Warsaw, 1931), 24 pp. ; Yidishe arbet in’m oyfboy fun erets yisroel (Jewish labor in the construction of the Land of Israel) (Tel Aviv, 1932), 55 pp. ; Legende un virklekhkeyt, zhabotinskis rol in’m yidishn legion un bay der fartaydikung fun tel khay (Legend and reality, Zhabotinsky’s role in the Jewish Legion and in the defense of Tel Ḥai) (Warsaw, 1933); Revizyonistisher emes in’m kamf kegn der e’y arbetershaft (Revisionist truth in the struggle against Israeli labor) (Warsaw, 1933), 52 pp. ; Birgerlekher tsienizm un arbeter-tsienizm (Bourgeois Zionism and laborer Zionism) (Warsaw, 1933), 55 pp. ; Di histadrut in ḳamf un boyen, an enṭfer di gegner fun dem organizirtn idishn arbeter in erets-yisroel (The Histadrut in struggle and building, an answer to those who oppose organized Jewish labor in the land of Israel) (New York, 1933), 47 pp. ; Di oyserlekhe un inerlekhe politik fun der tsienistisher organizatsye (The domestic and foreign policy of the Zionist Organization) (Warsaw, 1934), 32 pp. ; Unzer shlihes, farvirklekhung fun’m tsienizm un oyfgabn fun der arbetershafṭ (Our mission, the reality of Zionism and tasks of labor) (Warsaw, 1934), 332 pp. ; A yor fun kamf un dergreykhung (A year of struggle and accomplishment) (Warsaw, 1934), 32 pp. ; Di faktorn un oyfgabn fun tsienizm in itsikn moment (Factors and tasks for Zionism at the present moment) (Jerusalem, 1935), 40 pp. ; Der tsienizm in der tkufeh fun farvirklekhung (Zionism in the era of realism) (Warsaw, 1935), 51 pp. ; Unzer veg in tsienizm, a rede gehaltn oyf der letster sesye fun der aktsyons-komitet in yerusholaim (Our way in Zionism, a speech held at the final session of the action committee in Jerusalem) (New York, 1935), 31 pp. ; Dos bukh fun ferat (The book of Ferrat) (Jerusalem, 1939), 63 pp. Translations of his work from Hebrew to Yiddish: An entfer bevinen (An answer to Bevan) (Rome, 1946), 52 pp. ; Di yesoydes fun undzer medine (The foundations of our country) (Tel Aviv, 1948), 40 pp. ; Yisroel in krig (Israel at war), trans. Yisroel Ritov (New York, 1951), 420 pp. ; Medine-problemen, shlikhes un eygnartikeyt (Problems of state, mission and distinctiveness), from a speech given before officers of the Haganah (Jerusalem, 1951), 44 pp. 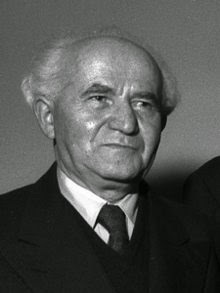 In Hebrew, Ben-Gurion contributed to Aḥdut (Unity, 1910), Kuntres (Pamphlet), Davar (Word), and Hapoel hatsair (The young worker), and he published his memoirs in Luaḥ aḥiever. More than twenty volumes of his works have appeared in Hebrew. His articles, written prior to the founding of the state, were included in four volumes entitled Bamaarakha (In the fight) (Tel Aviv, 1949/1950 or 1950/1951). In 1955 a book by Ben-Gurion was published in Buenos Aires, entitled Netzaḥ yisrael (The eternity of Israel), with a short introduction by M. Regalski and with a biography of Ben-Gurion written by Yehuda Erez. His writings have been published in English, French, German, Polish, and other languages. Sources: Zalmen Reyzen, Leksikon, vol. 1; D. Tidhar, Entsiklopedyah leḥalutse hayishuv uvonav (Encyclopedia of the founders and builders of Israel) (Tel Aviv, 1947-1971), vol. 3, see index; Beracha Habas, David ben-gurion vedoro (David Ben-Gurion and his generation) (Tel Aviv, 1951), 295 pp. ; Ḥ. Vital-Hurvitz, David ben-gurion (New York, 1952), 248 pp. ; Who Is Who in Israel (Tel Aviv, 1952); Who Is Who in World Jewry (New York, 1955). Several recent monographs: N. Alterman, Ben hameshorer lemedinai (Between poet and diplomat) (Tel Aviv, 1971); A. Aviḥai, David ben-guryon, meutsav hamedina (David Ben-Gurion, shaper of the nation) (Jerusalem: Keter, 1974); A. Volfenzon, David ben-guryon umedinat yisrael) (David Ben-Gurion and the state of Israel) (Tel Aviv: Am oved, 1974); M. Bar-Zohar, Ben-guryon (Ben-Gurion), 3 vols. (Tel Aviv: Am oved, 1975-1977), with translations into English, French, German, Vietnamese, and perhaps other languages; Sh. Peres, Gam beḥayil vegam beruaḥ, kavim lidemuto shel david ben-guryon (Both force and spirit, a portrait of David Ben-Gurion) (Tel Aviv: Am oved, 1974); Sh. Tevet, Kinat david, ḥaye david ben-guryon (David’s zeal, the life of David Ben-Gurion) (Jerusalem: Schocken, 1976), 2 vols. ; J. Goldstein, Lelo pesharot, heskem ben-guryon-jabotinski vekishlono, 1934-1935 (Uncompromising, the “Ben-Gurion-Jabotinsky agreement” and its failure, 1934-1935) (Tel Aviv: Yaroiv-Hadar, 1979).